If you know anything about Montenegro in summer, you know it's hot. Like 40 C / 100 F hot. While I'm lucky enough to work from home in air-conditioned comfort and wander down to the beach when I like, my husband Savo, is not. Savo works with yachts and spends a good part of his day outside in the heat. Look smart - important when your clients are multi-millionaires. Be durable enough to take lots of physical activity. Be comfortable and stretchy enough so he can move in the tight spaces on a boat. 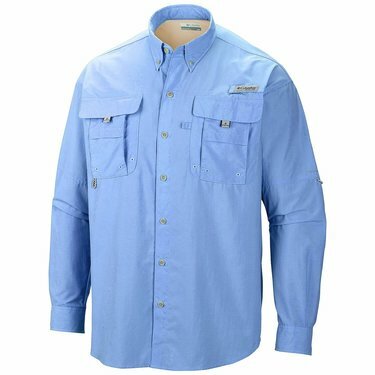 Savo's always liked the Columbia Bahama II PFG fishing shirts because they fulfill all of these criteria. They come in long sleeved and short sleeved versions and it's easy to just throw a vest over one and you've instantly got a winter outfit. So this year I wanted to get him something different, because he already has 5 of the PFG shirts! 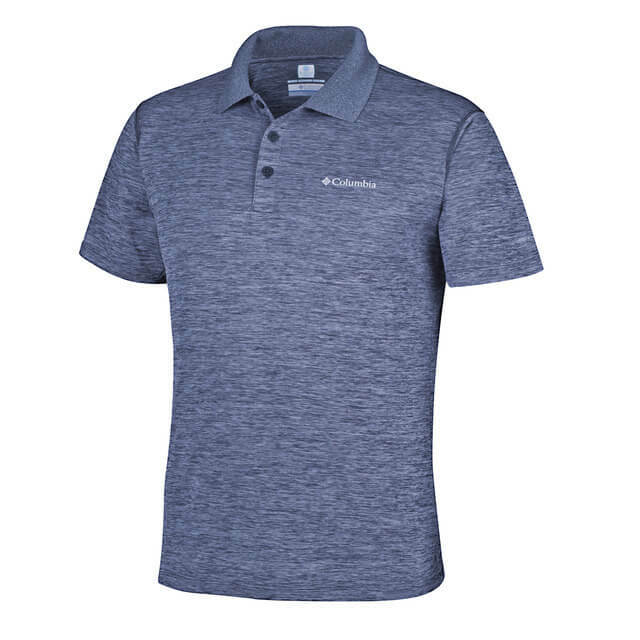 Since we already knew Columbia's shirts were good in this intense heat, I headed over there and came across the Columbia Omni Freeze Zero Rules Polo shirt. Omni Freeze Zero sweat activated cooling. Omni-shade sun protection - also important when you're outdoors all day. Omni-wick High-performance Wicking Fabric - I mean, who wants to walk around with big sweat marks all day?! So I decided to give it a shot and ordered one. At US$40 each, they're not the cheapest t-shirts around but I figured it would be worth it if they lived up to the hype. Savo usually wears an M in the PFG shirts, but since they're a relaxed fit and the polo is a slimmer fit, I got him an XL. Then I crossed my fingers and waited! First of all I was impressed with how good it looks. I ordered the carbon heather colour and the fabric is really nice. It has a slight sheen to it and you can tell it's good quality. But the real test would be on a typical summer work day. I was right and an XL is the perfect fit. Make sure you check the size guide before ordering because an M in one Columbia model won't necessarily mean you're an M in all of their tops. The polo is nice and stretchy so it's comfortable enough to move around in. And it clings nicely to those biceps that got my attention all those years ago ;). Cooling - does it work? Savo was amazed how comfortable and cool it was to wear in the summer heat. As promised, it's even cooler than the PFG shirts. In fact it's become his new favourite and I've got another on the way. This polo has replaced the Henry Lloyd polos that he was wearing until now. The Omni-wick fabric keeps him feeling comfortable and dry in the heat too. Rather than his shirt soaking through, it always feels dry. Ironing: Aside from its good looks and cooling fabric, there's another reason this polo gets the thumbs up from us. It doesn't need ironing! The PFG shirts and the Henry Lloyd polos both needed extensive ironing. With this polo, it just goes in the machine, on the line to dry and then it's ready to wear again. That makes it great for travelling too. Washes well: After several washes, even high performance t-shirts tend to get stretched out of shape and the fabric pulls. This shirt has been through the wash every other day all summer and it still looks as good as first wear. Sweat-proof: It's impossible not to sweat when it's 40 C / 100 F, but no one wants big sweat rings under their arms. Not only does sweating actually help cool you in this polo, it doesn't show so you feel confident no matter where you go. Anti-microbial treatment: You might be thinking that it's all very well that you can see it when you sweat in this shirt, but what about smelling it? Yep, we're talking about it. The anti-microbial treatment means the shirt doesn't smell either, even after a whole day running around in the sun. There are 8 colour options in the standard polo - definitely a colour to suit everyone! You can also get marbled grey and marbled blue. We got the marbled blue (carbon heather). We're so impressed with this t-shirt, we were happy to see Columbia has more in the range. There's a wide range of long and short sleeved tops, sportswear, everyday wear and accessories.